1. It's the economy, stupid: The U.S. economy grew by 2.9% in the third quarter compared to last year, making this the fastest growth rate America has seen in two years. The figure was better than expected. This is the last economic growth report before the presidential election in November. 2. Moody markets: All signs were pointing to a negative open on Wall Street earlier this morning. 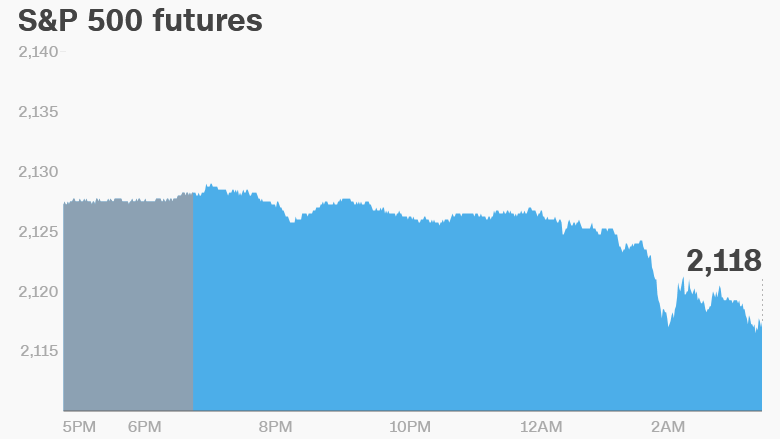 But now things have turned around and U.S. stock futures are steadying. However, European indexes are mostly falling in afternoon trading and most Asian markets closed the week with losses. This comes as markets are in the midst of a global bond sell-off. "The more/the faster treasuries sell-off, the greater the risk it becomes disorderly for other markets," wrote Kit Juckes, a strategist at Societe Generale. But don't get too panicked. "This is the end of a big bull market more than it's the start of a big nasty bear market, because growth, inflation and monetary policy prospects just don't add up to bond Armageddon," he said. 3. Baking up a deal: Shares in Baker Hughes (BHI) are spiking in extended trading after the Wall Street Journal reported that General Electric (GE) was looking to buy the firm. But enthusiasm faded a bit after General Electric said in a statement it was "in discussion with Baker Hughes on potential partnerships... [but] none of these options include an outright purchase." 4. Market movers -- Amazon, Alphabet, AB InBev, Baidu: Shares in Amazon (AMZN) are getting slammed after the company reported worse-than-expected quarterly results. This put a dent in the image of a company that seemed like it could do no wrong in recent months. Shares in beer giant Anheuser-Busch InBev (BUD) are slipping about 4% in Europe after the company reported results that came in below expectations. Shares in Google's parent company Alphabet (GOOGL) are set to jump a bit at the open after reporting a surge in sales and profit in the latest quarter. And shares in Baidu (BIDU) are dipping premarket after the company posted a slight decline in quarterly sales and forecast that revenue will continue falling in the current quarter. 5. Earnings: Exxon Mobil (XOM), Chevron (CVX), Goodyear Tire (GT), Hershey Foods (HSY) and Mastercard (MA) are releasing earnings before the open Friday.